There are more warnings of a stock market correction circulating now – especially since the Nasdaq and S&P 500 both reached closing record highs Friday. The Nasdaq Composite closed at a record high on Friday at 5,092.08. That was the first time the index had set a record in more than 15 years. The S&P 500 closed the week at 2,117.69. The Nasdaq and S&P 500 have now climbed 7.7% and 3% respectively in 2015. At the same time, more than $79 billion has left U.S. stock funds this year. This "big decoupling" between money flowing into stocks and company share prices is a sign of a looming stock market correction, according to analysts from Bank of America Merrill Lynch. A market correction is when there is a 10% or greater drop in share prices. Check out BofA's chart. It shows how the amount of money in U.S. stocks has fallen from about $179 billion at the start of 2015, to near $100 billion today. The same research note also shows outflows in nine of the last 10 weeks. Investors haven't taken money out of the markets at such a high rate since 2009. 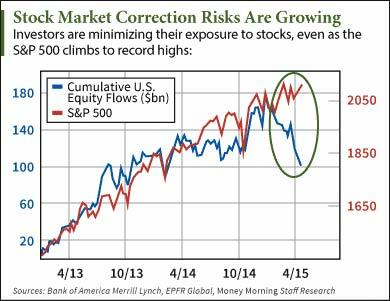 "Correction risks will grow in [the] absence of fresh inflows in coming weeks," analysts wrote. To get more insight on the chances of a stock market correction in coming weeks, we asked Money Morning's Chief Investment Strategist Keith Fitz-Gerald what he's telling investors to watch for now. "The current bull market is now the fourth longest on record in the last 115 years and nearly twice the length of the average bull run," Fitz-Gerald told readers this weekend. "At the same time, stocks are getting pricey and fears of a Fed-led rate hike are creeping in around the edges." "Yet, this is not the time to run for the hills," he continued. It's only human to get nervous about a stock market correction. But letting your emotions decide your investing moves can lead to losses. The fact is corrections are part of the market. No bull market can last forever, and corrections are usually short-term situations. And investors who dwell on potential short-term losses often end up missing profit opportunities. Fitz-Gerald points out research from InvestTech, Bloomberg, and S&P Capital IQ that shows how bull markets can tack on another 20% or more during their final stages. Plus, investors who leave the market will miss out on any gains when the market starts climbing again. "The best way to play a correction is to stick to 'must-have' companies in technology, biopharma, defense, and energy – all of which have been shown to outperform as a bull market ages," Fitz-Gerald continued. "'Must-have companies' making, distributing, and selling services the world cannot live without are the way to go," he explained. "No matter how bad the world gets or what kind of political leadership we inherit, you're still going to need the stuff they make." Fitz-Gerald said "you'll know you've found one when you see the higher than average profit growth that goes with the territory." The Bottom Line: Risks of a stock market correction are here, but that doesn't mean you should flee the markets. Fitz-Gerald recommends investing in "must-have companies." Their services and products will always be necessary for consumers, even if the markets are turbulent. Nothing new here. Same predictions about a correction have been ongoing for 5 years running. Eventually, it will happen. We are still shell-shocked from the last one in 2008-2009. The problem is it really hurt. The financial crisis permanently shattered international confidence in the U.S. Dollar, the U.S. financial system and its banks, and by extension, the entire United States Government. It has not recovered and neither has the economy, despite FED QE's and Stimulus ( More Debt ). I don't think America will remain intact 50 years from now. We will just atrophy and gradually fade away. Muslims might even take over in 20 more years. Anything is possible. Our overseas reputation is slipping farther away and nobody really notices or much cares. We are lost and adrift without a rudder. Pretty sad to risk losing it all and not care enough to respond to it. Its a great argument to own some physical gold and silver. Few do, but they will change eventually, I predict.